Welcome back! While we were in Senegal one of the artists that was very helpful in connecting us with many other talented artists was Akassa. Akassa has a cubist style, but a variety of series inspired by family, life and the beauty that surrounds him. Come join me for a ride learn more about what inspires him and watch a demonstration of his sand painting technique in the studio of Akassa in Dakar Senegal. Welcome Back. The Dak Art 2 exhibition opens next week. Thursday 6/23/11 from 6-9 is the collector's preview and the exhibit opening is 6/24/11 from 6-11 pm. Many of you who attended DAk Art Chicago back in 2007 at Gallery Guichard remeber and know Amadou Thiam a antique African Art dealer for over the past 40 years and Gallerist of contemporary senegalese artists and owner of the Yaccine Art Gallery . We have had the pleasure of getting to know and work closely with him for the past 5 years. He is truly a family member and we were so honored to finally visit his Gallery and Hotel which he built in the shape of a Lion. Join me for a tour as we listen and learn about antique African art and enjoy many contemporary Senegalese artists at his Gallery and in his collection. Welcome Back. The Bombay Sapphire Artisan Series is back again this year. This is the juried art contest that swept across America last year and went to 8 cities and two winners were selected in each city. The two finalist from each city, as well as four online winners were all sent to the Finale exhibition in Miami during Art Basel Miami last December. Two winners were selected in Miami and were given a show in New York City at Rush Galleries. The program is on again and two new cities were added, Boston & San Francisco. Last year and again this year the program kicks off at the annual "ART For Life" benefit at Russell Simmons' sprawling estate in the East Hamptons. This year UPTOWN magazine has partnered with the Artisan Series to give two lucky winners the opportunity to go to this event for FREE! This is a highly sought after ticket because the event is attended by "A" list stars and entertainment moguls which retails for $1500 each. Round trip air fare and hotel accomodations are also provided. The Chicago Finale last year at Gallery Guichard was phenomenal and the two Chicago winners were Gerald Griffin and Debra Hand! Next week's Uptown event will also feature an exhibit of work by the two winning artists and other Chicago finalists. Come Enjoy a ride back in history with me when the Artisan Series came to Chicago South of Roosevelt Road! Dak Art 2: "I Am My Brother's Keeper"
On May 4, 2011, Frances and I left Chicago to visit Dakar, Senegal on a mission to meet with the Minster and the Managing Director of Arts and Tourism, say hello to our old friend and Gallerist in Dakar Amodou Thiam (who we collaborated with on the first Dak Art Chicago exhibit in 2007) and meet artists of Senegal to bring you a spectacular, of the Diaspora, exhibition. Many people who visit Dakar, Senegal and the Door of No Return manifest a truly spiritual experience. We had a very enriching and culturally significant experience, which we will share with you as you journey with us on our trip to Senegal. It was so significant that it has hurled me back into my role of blogging. I see this as my responsibility to share my experience with the art community and invite the art community to share in the experience beyond this blog and our upcoming exhibits, as you will see as I continue this series of blogs... so keep reading and stay tuned. I further understand my role as not only sharing the experience about the arts and collectors South of Roosevelt Road, but also about sharing the arts and artists of the African Diaspora that reside around the globe; bringing to you artists and their experiences from many different parts the world. I have, on many occasions, been told that people enjoy the educational aspect of this role and I miss sharing this important information as so many love and miss receiving my blog. I am happy to say I AM BACK! Omar Samb, Managing Director of Arts and Tourism was our host and guide during our stay, where we received a plethora of historical and cultural information and experiences. We affectionately refer to him and his wife as family. We are sure you too will find family in Senegal. Please join in as we share with you the warm welcome reception we received as we were greeted with and introduced to several local artists and crafters of Senegal. The Minister of Arts and Tourism, Thierno Lo and Omar SAMB welcomed us home with a grand reception and hospitality fit for a king and queen returning home. Please join Frances Guichard as she interviews Omar SAMB about the historical and cultural perspectives of the bridge between Africa and other parts of the Diaspora. Senegal is bursting with creativity and incredible artwork. Please join me as we visit one of the exhibiting artists Mahmoud Baba LY in his studio in Dakar's Artists' District . Please join me as we discuss a recent collector's perspective of Baba Ly's work during a recent sneak preview at "Sisters & Friends - 2011 in Bloomington, IL. 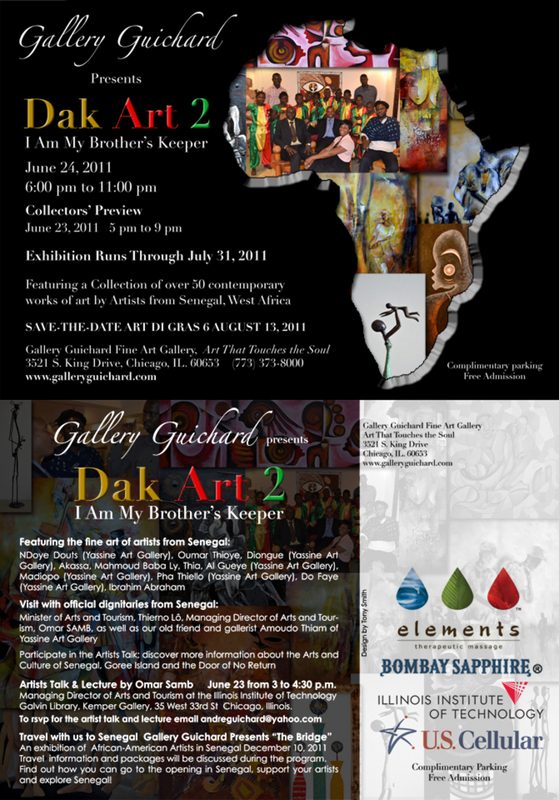 Mark your calendars for the opening exhibition of Dak Art 2: "I AM MY BROTHER'S KEEPER," June 24, 2011 from 6 pm to 11 pm and Collectors' Preview on June 23, 2011 from 5 pm to 9 pm at Gallery Guichard and experience the artwork of featured Senegeale artists NDoye Douts (of Yassine Art Gallery), Oumar Thioye, Diongue (of Yassine Art Gallery), Akassa, Mahmoud Baba Ly, Thia, Al Gueye (of Yassine Art Gallery), Madiopo (of Yassine Art Gallery), Pha Thiello (of Yassine Art Gallery), Do Faye (of Yassine Art Gallery), Ibrahim Abraham, and Their. The exhibition will not only be an opportunity to see this amazing exhibition, but also a chance to meet several of the artists and welcome esteemed dignitaries from the government of Senegal, the Minister of Arts and Tourism, Thierno Lo, and our gracious host Managing Director of Arts and Tourism Omar SAMB . Please join us on the 24th of June as as we give a warm welcome to our brothers from Senegal. Please stay tuned to upcoming blogs with interviews from more artists from Senegal and our old and treasured friend Amodou Thiam, owner and director of the Yassine Art Gallery, Dakar Senegal. Also, we will be updating you on the exciting 2011 Bombay Sapphire Artisan Series Nationwide juried art contest which kicks off on July 30th at Russell Simmons house in the Hamptons.. Welcome Back! Did you know Bombay Sapphire, Russell and Danny Simmons of Rush Foundation, teamed up and created an art contest sweeping across America where two winners are being selected in each city? The finalist of all of the cities will be part of a finale in Miami during Art Basel. The winner of that exhibit will have their work installed in an exhibit in New York at Rush Galleries. Come join me as we ride the wave of excitement when the Chicago Finale came to Bronzeville South of Roosevelt Road! Welcome back. It has been a fantastic summer. Were you at Yanga Fest last weekend at the DuSable Museum? If not you missed a fabulous first class production. Dr. Adams is bringing so much Energy and Excitement to the Museum and has helped to make it a Dynamic Museum not a static Museum. She is spearheading phenomenal programing and innovative partnerships like "Gallery Guichard at Dusable Museum". Join me for an enlightening conversation with a friend an Iconic leader of an Iconic institution The first African American History Museum in the country The DuSable Museum. The DuSable Museum is celebrating African American people our history and our experiences and it is imperative that we celebrate and support the Museum now more than ever before. Next weekend come out and participate in their end of the summer fundraiser "Rock The Boat"
Welcome Back! 100 artists 100 collectors South of Roosevelt Rd. Today I would like to introduce you to Louisiana artist Robert Ketchens. He is the first artist to be featured in the Sapphire Solo Series. Robert's Solo exhibit opens July, 15, 2010 at the DuSable Museum from 6 pm to 9pm. The exhibit Runs through September 15, 2010. Come along and learn more about Robert and view some of the works that are part of the exhibition. Until next time. Be an Art Activist and come out and see the new exhibition and share this blog with a friend. Welcome back. 100 artist , 100 collectors South of Roosevelt Rd. Please come along for another great opportunity to go inside the home and see another wonderful collection. James Harvey is also a member of the collector organization Diasporal Rhythms. Learn more about why James believes activism is important as well as advice for the first time collector. Until next time be an Art Activist. Send this blog to a friend. 100 artists, 100 collectors South of Roosevelt Rd. Did you know earlier this month Bronzeville was the host of an international South African Artist, Andries Botha and one of his life size elephants Nomkhubulwane at the IIT campus? Come join me as we learn about the international journey of Nomkhubulwane and his visit to Chicago. Here is your opportunity to meet Andries Botha. Continue on to Part 2, to see and hear the second video with details about Andries's Inspiration: The Human Elephant Foundation. As said by Andries, "An Artists' work has to bear testimony to part of the solution of our world problems..." he also states, "Make art for Children." Make sure you watch the next video with Miles Guichard and see how children interact with the sculpture. Continue on to the third video with details about Andries's background as an artist and his creative process. Artist: Abiola Akintola "The day before his Journey to China"
Welcome back. 100 artists, 100 collectors South of Roosevelt Road is the journey. A good friend and fantastic artist Abiola Akintola shared some time with me the day before he left for China, where he will be embarking on a phenomenal journey which is sure to change his life and art career forever. Come join me as we learn more about Abiola Akintola. make sure you watch the next video. Be An Art Activist ! share this blog with a friend! Art Philanthropist and Collector: Allen Turner "A Good Collector"
Welcome back. It has been a minute since we last shared our journey of 100 artist, 100 collectors and events South of Roosevelt Rd. Recently at the DuSable Museum there was an opening for the new group exhibition featuring over 25 local and nationally acclaimed artists entitled "Common Bonds". The DuSable Museum exhibition runs through June 30th 2010. At the opening one of the featured artists Ted Ellis of Houston, Texas was present and was honored to have five of his original paintings donated to the DuSable Museum by Philanthropist Allen Turner. Please join me as we talk with Allen Turner gaining insight on how he and his wife approach activism and his definition of "A Good Collector". We also hear from Ted Ellis on his special day. Stay tuned for the next blog! I plan to post additional videos of that wonderful evening where President Dr. Carol Adams will also talk about her passion and new role as president of the DuSable Museum . Welcome back. 100 collectors and 100 artists South of Roosevelt Road is the initial goal that motivates me to continue to peel back the skins of the onion of our rich multifaceted arts community. Collectors come from all walks of life. Pastor Henry O. Hardy is a man of the cloth who has been preaching the word of God for more than 40 years at Cosmopolitan Community Church on Chicago's South Side. One of his other passions in life is collecting original art. With over 50 original paintings and sculptures in his collection, Hardy eloquently expresses the joys of living with original art everyday. Please join me for a tour and thought provoking discussion as we ride the cultural wave with Pastor Henry O. Hardy. Until next time. Be a cultural activist. Share this blog with a friend. Welcome Back! 100 collectors 100 artists South of Roosevelt Road is the goal. February was a busy month full of art events and artists features. I am now focusing the attention back on the collectors.This week I am happy to introduce to you a collector who lives South of Roosevelt Road who lived in Atlanta for 7 years and has a collection of over 200 works with roughly 80% of his works of artists from the Atlanta area. Come along for a ride as Darwin Brown gives us a personal tour of his collection and shares many perspectives regarding his collecting style. Until next time be an Art Activist and share this blog with a friend. I was recently honored by 5/3 rd bank when they acquired one of the works of art from my Jazz series for their Hyde Park Branch. It reminded me of a local collector Curtis Jones who would have regular unveilings at his home when an artist completed a commissioned work of art for him. I would walk away feeling educated and inspired. The experience at 5/3 rd was equally fulfilling and a wonderful example of how some of our corporate neighbors are making a difference by acknowledging the diversity of their employees and customers by the types of artwork they acquire and place in their places of business. I challenge you to commission an artist to create a special work of art for you and celebrate the arrival of that art with an unveiling in your home and or business. Art Event: 8th Annual Gallery D'Estee 2010 "Art Is Infinite"
Welcome back art lovers. For those of you who were not at this years 8th Annual Gallery D' Estee 2010 "Art Is Infinite" which was held March 5th and 6th at the Delta House 4525 s. King Drive in Bronzeville it was the best yet. The event was there annual fundraiser which was a testament to the power of activism, passion, commitment and dedication to the contemporary fine art and artist of the African Diaspora. The show reminded me of my travels to the east coast to the New York Black Fine Art Show. The level of urgency about collecting original artwork "Now" by artist of the African Diaspora was contagious and filled the room. It was electric! Packed with wall to wall lovers of Fine Art they were there not to just look , but they took home treasures that would last a lifetime. The exhibition included the works of many prominent artists from Chicago and from around the country including Calvin Coleman, Abiola Akintola, Debra Hand, Felicia Grant-Preston, Dalton Brown, Dayo Laoye, Andre Guichard, Dana Todd, Joyce Owens, Stacey Brown, Frank Frazier, Philippe Gibson, Tony Smith, Bruce Jefferson, Tia Etu, Pearlie Taylor, Najee, Marva Jolly. The program highlights included Chicago Alumnae's Arts and Letters Co-Chairs Pamela Hamb and Linda Murray, Scholar, Philanthropist and Doyen of Fine Art Daniel T. Parker was honored , Artist Tony Wade was this years featured artist,scholarship reciepient Eric Rashad, art institution recipient South Side Community Art Centers board president Diane Carr and Delta Sigma Theta, Chicago Alumnae Chapter President Taliva A. Tilman. Be an Art Activist. Share this blog with a friend. International Sculptor: Robert Chimungwa: "Soul of The Stone"
The journey continues 100 artist 100 collectors south of Roosevelt rd.Two-years ago an international bridge was connected between Gallery Guichard and the Yassine Art Center in Dakar Senegal in an exhibit called "Dak Art Chicago" featuring 90 works of Contemporary Senegalese painters and sculptors. Last month with the Help of the South African Consulate , MEGA (Mpumalanga Economic Growth Agency), Illinois Institute of Technology - IIT, US Cellular and Light on the Hill for Africa we were able to connect another bridge from South Africa to Bronzeville. "Soul of The Stone" features the fine art sculptures of Robert Kaliyongo Chimungwa . Robert Chimungwa touched Chicago with his humility, and God given talent.The exhibition includes 40 original sculptures in African Jade, Verdite and Redwood. The exhibition runs through March 31, 2010. It is with great pleasure that I introduce you to Mr. Robert Kaliyongo Chimungwa. Be an Art Activist share this blog with a friend. Welcome back. I have a wonderful treat for you. In the next two blogs we will see and hear about a powerful exhibition recently opened at The President's Gallery at Chicago State University "The Fierce Urgency of Now" featuring the fine art photography of acclaimed photographer Bobby Sengstacke. Please join me as I spend time with the gallery curator Joyce Owens who gives powerful insight to the exhibit and fine art photography as a whole. When we started this journey I promised to keep you informed about great art events South of Roosevelt Road. How better to kick off this important aspect of the blog by paying deference to one of our iconic institutions The South Side Community Art Center which is celebrating it's 70th anniversary. Join me for a great conversation with Board President Diane Carr about the history, and the exciting festivities planned that you will not want to miss! See you next time. Be a Art Activist! Share this blog with a friend. The journey continues.100 artist 100 collectors. It is my pleasure to introduce you to artist Dayo Layoe. Come with me as we enter Dayo's world an learn more about his background, painting style, motivation and how America influenced him. Be an art activist! Forward this blog to a friend or someone interested in the arts. Next up, as part of my spotlight on 100 artist you can find South of Roosevelt Road I would like to introduce you to Bruce Jefferson. Originally from Ohio Bruce has been painting professionally in Chicago for over 22 years. Here we learn some insights about Bruce's creative process and see a sample of his works. Bruce recently produced a 26 minute video describing his journey in Chicago entitled Museum Detours. To view the 26 minute video go to http://www.youtube.com/watch?v=orFsqnNofdc&feature=related. Author: Dr. Diane Grams "How art communities in Chicago are different"
As we learn about the first group of 100 artists and collectors south of Roosevelt Road, it is equally important that we understand the differences in the art communities in Chicago and what makes them different. About 6 years ago, I was interviewed by an interesting woman named Diane Grams. As an artist I was happy to see she was interviewing scores of artists and collectors from the south side of Chicago. During my last blog interview with Patric McCoy, she happened to be visiting Patric. She came to celebrate the submission of her edited manuscript of her new book to her publisher University of Chicago about the differences in art communities in Chicago. Dr. Grams, artist, author and professor is the recipient of a MacArthur Foundation grant where she studied the type of art activities that were taking place in 10 different art communities in Chicago. She later focused her PHD dissertation on 3 neighborhoods (Bronzeville, Pilsen, and Rogers Park). Diane graduated from Loyola University with a PHD in Sociology. Diane currently is a professor at Tulane University where she teaches Sociology of Culture. Diane is publishing a book in conjunction with the University of Chicago. The 400 page book, called Producing Local Color, studies the art production networks in three neighborhoods in Chicago. Press the arrow below to hear more about "The five ways art plays a role in different Chicago communities"
Be an art activist and share this blog with a friend ! Please join me as we go inside the home of Master collector Daniel T. Parker. Daniel is also a Co - Founder of the collector organization Diasporal Rhythms and Author of "African Art The Diaspora and Beyond". Dan represents part of the changing panorama of what is thought to be the typical art collector. Welcome back! This is the beginning of an introduction of the artists and the fingerprints they represent. It is with pleasure to introduce to you an incredibly talented emerging artist Max Sansing. One of the most momentous and auspicious occasions in our history spurred a memorable series of events of presidential debate viewing parties that recently took place at an art gallery. Neighbors and collectors gathered to listen to the presidential debates and were able to share and learn different perspectives. The galleries on the south side in many cases have become a meeting place where like-minded people enjoy and experience a wide variety of life experiences with the backdrop of beautiful art. Through creating an environment that is comfortable, inviting and allow a platform for a variety of events, the gallery has helped to create a new reality and comfort level for people who otherwise might not visit an art gallery. Because of intimidation or just lack of awareness, often an introduction to a gallery or fine art may occur by circumstance, but later leading to an awareness and sparked interest. It also can help remove some of the stigma associated with art galleries, being cold and uninviting. Living with art, is a wonderful experience. For some, the first interactions, have started with being at and around events with art, this has created an interest for art in their very own living space. Art plays many roles, and is a common thread for many people from all walks of life woven together. In this case the fine art gallery has played a role as a cornerstone and meeting place for a variety of platforms. This phenomena, if continued, could also help bring the community closer together and facilitate group awareness about a variety of current issues. Change is constant and seeing a community use and embrace a place of art as a familiar and comfortable backdrop, may very well be the bridge which opens the doors to talking about other important issues, and at the same time bring the awareness of the artists and their individual fingerprints of creativity. We cannot begin to understand the Fine Art South of Roosevelt Road without understanding its real history. My Grandmother Irene Guichard was a incredible woman from New Orleans who helped me understand deference at an early age. Before you can talk about any living artist or collector, we have to pay homage and give deference to the South Side Community Art Center and understand that the galleries and collectors on the south side are continuing a glorious legacy. the center jump-started the careers for many artists such as Archibald Motley Jr., Elizabeth Catlett, Charles White, Gordon Parks, Dr, Margaret Burroughs, and Gwendolyn Brooks, just to name a few. The Center was a venue where artists and youth were taught the visual arts . 70 years in 2010 . Kim McCollough, Mayor Richard M. Daley, and Dianne Carr at the Sponsor Reception. operating expenses for the center. Fine Art South of Roosevelt Road is a blog for everyone. It is for anyone from any cultural background interested in an education about fine art and artists south of Roosevelt road, and beyond. It is also for anyone interested in expanding and maturing their fine art collection to include the diversity of artists of color. It is also for people who may or may not already collect, but want to learn about new artists, collectors and upcoming art events south of Roosevelt. Here resides an art community that is often invisible to the mainstream but has been a community within the larger community for 70 plus years. It is without question a cultural phenomena that stands on the shoulders of the South Side Community Art Center, that paved the way for other contemporary galleries in the community, such as Steele Life Gallery, Faie African Art, and Gallery Guichard. The mission of Fine Art South of Roosevelt Road is to peel back the many skins of the onion. I am using the onion as a metaphor to describe the many layers of artists: emerging, mid-career, and masters and the density of the collector community, that include collector clubs like Diasporal Rhythms, a very culturally rich multifaceted community. to over 100 artists (many published in books; collected by museums; and part of corporate and private collections, nationally and internationally). A lot of these works of art are produced south of Roosevelt Road. Additionally, we will also introduce you to many artists who are part of the African Diaspora - the spreading out of the people of African descent. I will also introduce you to 100 plus collectors who reside south of Roosevelt Road, (many with hundreds of fine art works in their collection). The journey will take you into the homes of hundreds of collectors from all walks of life, business owners, doctors, lawyers, television news anchors, professional athletes, mounted police officers, teachers, simply put, people from all walks of life with a common thread who have love for the art and artists of the African Diaspora. Many of these collectors live around the country and travel to Bronzeville to find their treasures. The initial journey will start with the South Side Community Art Center, that is approaching it's 70th anniversary. We will then continue to peel back the skin of the onion and rotate the focus from collectors to artists and other art institutions. Lastly, we will tell you about great art events south of Roosevelt Road and keep you informed, about the many wonderful exhibitions around the country, as our artists and galleries take their exhibitions on the road. We invite you to come and experience the renaissance for yourself.